Expectations for rookie NFL players vary widely depending on their position and draft position. One of the older assumptions of the NFL Draft is that rookie wide receivers face one of the steepest learning curves adjusting from college to the pros. The wide receivers of the 2014 draft class are blowing away that assumption. As Jared Dubin outlined on The Cauldron, the 2014 class of wide receivers are severely outpacing the numbers rookie receivers have put up in previous years. Several wide receivers taken in the 2014 draft have emerged as regular rotation players and some of the top targets in their teams’ offenses. This chart from Dubin’s post shows the projected final numbers of the top 15 rookie receivers in receptions compared to the top-15 in receptions from previous draft classes. The 2014 class is on pace to finish with far more targets, catches, yards, touchdowns, and yards per game. It’s worth noting, of course, that many of the teams with rookie receivers excelling have losing records. Losing teams often throw the ball more, so there are more catches to be had. Nonetheless, this class of rookies are destroying the narrative that wide receiver is the toughest position to adjust to in the NFL. Five rookies already have more than 500 receiving yards: Carolina’s Kelvin Benjamin (leading all rookie wide receivers with 659 yards and 7 touchdowns), Buffalo’s Sammy Watkins (617 yards and 5 TDs), Tampa’s Mike Evans (585 yards and 5 TDs), Jacksonville’s Allen Robinson (548 yards and 2 TDs), and New Orleans’ Brandin Cooks (500 yards and 5 TDs). Several other rookies have stepped into bigger roles because of injuries to their team. 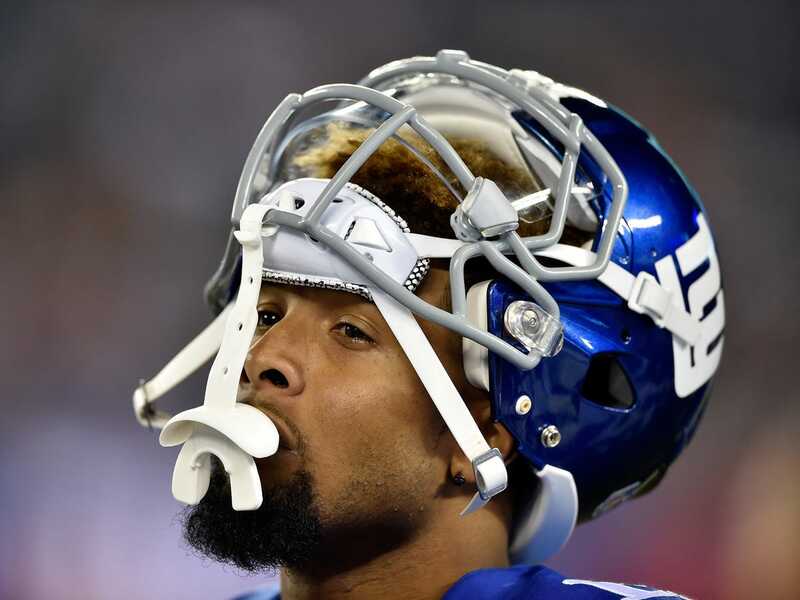 For the Giants, Odell Beckham Jr. has stepped up in Victor Cruz’s absence, becoming Eli Manning’s go-to receiver in recent weeks. After not playing early in the season, Beckham has 370 yards to go with 5 touchdowns in five weeks. He earned praise from Richard Sherman last Sunday en route to 7 catches and 108 yards in the Giants’ loss. Even some winning teams seem to have found receiving talent deep in the draft. The Eagles, Cardinals, and Steelers have all been targeting their rookie receivers, none of whom were taken in the first round. Philadelphia’s Jordan Matthews, taken in the second round, has 451 yards on 39 catches; Arizona’s John Brown (third round) 399 yards on 29 catches. Pittsburgh’s Martavis Bryant, taken in the fourth round, has 310 yards on 14 targets, but is second among rookies in touchdowns with 6. Given how quickly this batch of rookies have adjusted to the NFL, with more years under their belts, they could be the next crop of elite wide receivers.